Hilda Jochsberger was born in Leutershausen, a small village of fewer than 2000 people near Ansbach, Germany on 27 December 1920. Her father was a cattle dealer. There were only a few Jewish families in that community. Her mother gave her a piano at age five, and by seven, she was studying with a teacher in Ansbach. As a young girl, she was friends with Paula Stern, who later became the mother of Henry Kissinger. While the family was not religious, she learned to read some Hebrew from a traveling Hebrew teacher. At age ten, she went to live with her aunt in Heilbronn am Neckar to study in the Realschule school for girls there. In 1933, she went to study in Wurzberg at an orthodox teacher’s seminary after German public schools became closed for Jews. At this place she became embued with Jewish culture and learning, and became observant. At the school, she was known for her musicianship, sight reading in the music education classes, and playing four-hand piano with the teacher. She remained at the school for five years, learning also the cello and playing in small ensembles. Around 1938, Hilda learned from a friend of hers of an opportunity to play an audition for Emil Hauser, the director of the Palestine Conservatory of Music, visiting in Berlin. Her friend was accepted, and sent her a postcard suggesting she try as well. When she heard she was accepted, she went to Breslau to study Hebrew with a friend in anticipation of the move to Palestine. Her mother encouraged her to learn a practical craft, so she also studied sewing in Breslau. It was during that time that Kristallnacht occurred. When she got her papers, she left from Munich to Trieste and then landed in Haifa, where she met some people from her local communities. Hilda’s mother sent her piano, and a huge trunk from their home. She moved in with relatives in Jerusalem. It was in Israel that she changed her name to Tsipora. She started school there and worked as a maid for her social worker to make some extra money. Then she started teaching the recorder and accumulated many students, as well as serving as an accompanist at the academy, given her excellent piano sight reading skills. This allowed her some economic independence. When she graduated in 1942, she became a music teacher at a local Palestine Academy (an Arab teacher’s college), which taught in English, and Emil Hauser was director. (Later it became the Rubin Academy of Music). At this school she created an entire music program, started a yearly music festival, established a choir, and had girls playing recorders. The student body, which was partially Muslim and partially Christian students, were not at all interested in Arab folk music, but more western music. These women in turn went out to teach music in the English schools. Additionally, she taught children in Conservatory in Jerusalem. After 1945, Tsipora found out what had happened to her parents during the war and how they perished. She gave up all religious observance from then on, although she retained a life-long philosophical closeness to Orthodoxy in many respects. She went to meet some surviving relatives in the US in 1947, and spent the summer studying at Julliard in NY. She returned in the Fall to Palestine. When Israel’s independence was declared, she volunteered for the effort doing first aid and health work during the siege of Jerusalem. She also served as a director at the academy. Around 1949, she approached Simon Halkin of the Jewish Agency with her idea of using music to develop and strengthen the identity of assimilated Jews in the US . In the summer of 1950, she came to NY. She wanted to teach Jewish (and Israeli) songs with recorders, and she started teaching college students recorder at the Herzlia, Hillel at Brooklyn College, Hillel at Hunter College, at JTS and at Yeshiva University. She then connected with the Hebrew Arts Foundation, founded by Moshe Davis and some others at JTS, which also wanted to teach Judaism through the arts. They had a dance group, orchestra and a theater but wanted to start a music school. In Fall of 1952, the first music classes were held, with Tzipora teaching recorder and Fred Berk teaching dance. The school flourished and grew and became an institution in NY. In the meantime, Tzipora also served as choral director for the Society for the Advancement of Judaism, or Mordecai Kaplan’s synagogue. Her involvement with The Hebrew Arts School (now known as Kaufman Music Center) in New York continued until her retirement in 1985. In 1956, she began her studies at the Jewish Theological Seminary, counting Hugo Weisgal, Max Wohlberg, and Johanna Spector among her teachers. She earned her Master’s (1959) and Doctoral (1972) degrees in Jewish music at JTS. Tzipora Jochsberger became known for her published books and especially for the 10-part series made in the 1990s for video on the world of Jewish music. Today, many clips from these shows appear on Youtube and other venues. In 1986, Jochsberger “retired” to Israel but remained active. She founded the Israel Music Heritage Project (IMHP) to “preserve, foster, and disseminate knowledge of the varied musical traditions of the Jewish people.” Jochsberger was executive producer of the IMHP’s ten-part documentary series, A People and Its Music, which explores the musics of various Jewish communities in Israel whose origins come from Eastern Europe, North Africa, as well as the Middle East. On top of all her educational endeavors, Jochsberger was a composer and was a member of the Israel Composer’s League and of ACUM, and a member of ASCAP (since 1965). Many of her works are choral compositions, some of which have been recorded, yet many of her compositions remain unpublished. 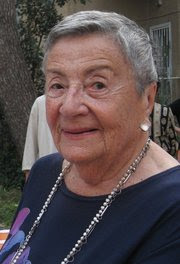 Later in life she served on many boards, including the Zimriyah: The International Assembly of Choirs in Israel; the Jerusalem Institute of Contemporary Music; the Jerusalem School for Music and Arts; and rejoining the board of governors of the Jerusalem Rubin Academy for Music and Dance in 1990. Publications include: Music of the Jewish People (1976); A Kaleidoscope of Jewish Music (1978); A Harvest of Jewish Song (1980); Hava N’halela: A Method for the Recorder Based on Israeli Folk Melodies (1987); Television series, host and producer; A People and Its Music (1991–).